In the game, a player controls RoboCop who advances through various stages that are taken from the 1987 movie. The bonus screen is a target shooting range that uses a first-person perspective. The intermission features digitized voices from the actors. 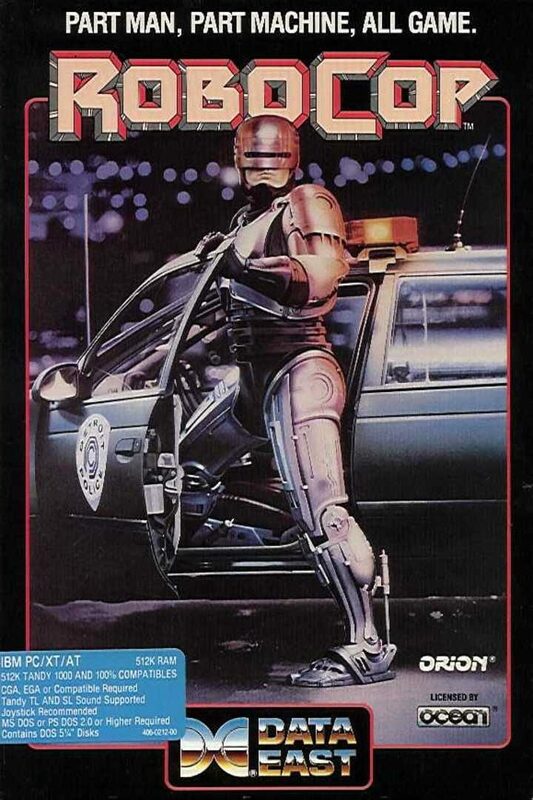 RoboCop was licenced by UK-based Ocean Software at the script stage, so (fairly uniquely for the time) the 1988 run & gun and beat 'em up hybrid arcade game developed and published by Data East and Nihon Bussan, was licensed from a computer game company rather than the other way around. This is why the arcade game bears a licence credit for Ocean. Several reworked versions appeared for home computers and video game consoles, most of them handled by Ocean, as well as a NES version ported by Sakata SAS and published by Data East. It has more recently appeared on mobile phones. The IBM and Apple ports were produced by US-based Quicksilver Software. Unlike the other home versions, the Commodore 64 version is a mostly original game that only loosely follows the arcade RoboCop. In addition to a different soundtrack, the boss battles are replaced with a screen where the player must shoot a man holding a woman hostage (without hitting her). The original European cassette tape version was notorious for a huge number of bugs (which were cleaned up in the US disk release). The games capture the spirit of the RoboCop film to some degree, as it involves killing generic criminals and enemy bosses, like the dangerous ED-209. Being quite popular, RoboCop was followed by several sequels (most of them handled by Ocean), including RoboCop 2, RoboCop 3, and RoboCop versus The Terminator which was developed for, but never released in arcades, and was later ported to several other consoles including the Sega Mega Drive, Super NES, Nintendo Game Boy, Sega Game Gear, and even as a final generation title for the Sega Master System in Europe.